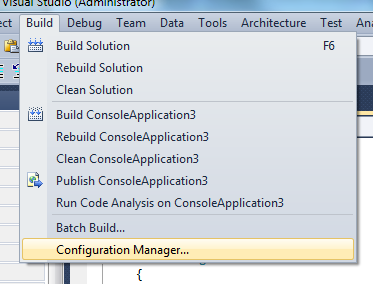 You can edit a solution configuration by using the Configuration Manager. You can bring up the configuration manager in several different ways. By default, the solution configuration will be mapped to corresponding build configuration and platform choices in the default child project. For example, as you switch between Debug and Release in the solution configuration, you’ll get configurations in which the project’s build configuration is Debug or Release.